Derry Rovers despatch Kilcock Celtic. Kilcock Celtic despatched by Newbridge United. 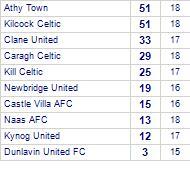 Newbridge United has yet to be beaten in this competition, having won 1 out of its last 2 games. Kill Celtic despatched by Kilcock Celtic.